Take a trip down Memory lane with these old-Fashioned favourites . Whether you are planning a family afternoon tea , Dinner party or for a girl's indulgent get together , these are extremely simple to make , inexpensive , fool proof , quick and a Special salute to the fantastic berries . 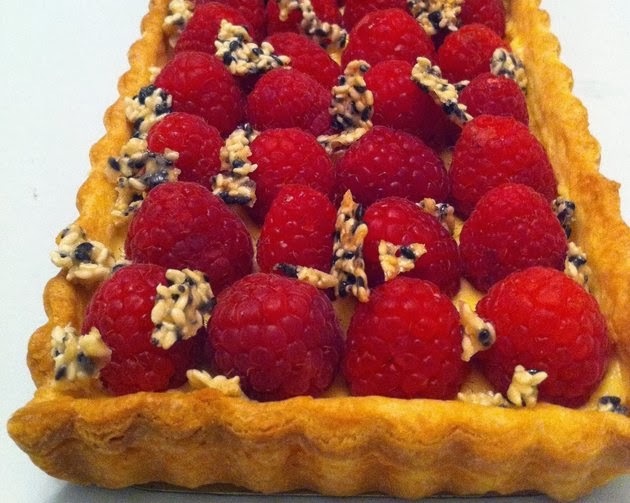 I just love the flavour of White Chocolate with fresh Blackberries , or lemon cream with Raspberries but a special favourite in my household is the Classic Creme Patisserie with either of the Raspberries or Blackberries . The Sesame Praline adds an extra savoury dimension . 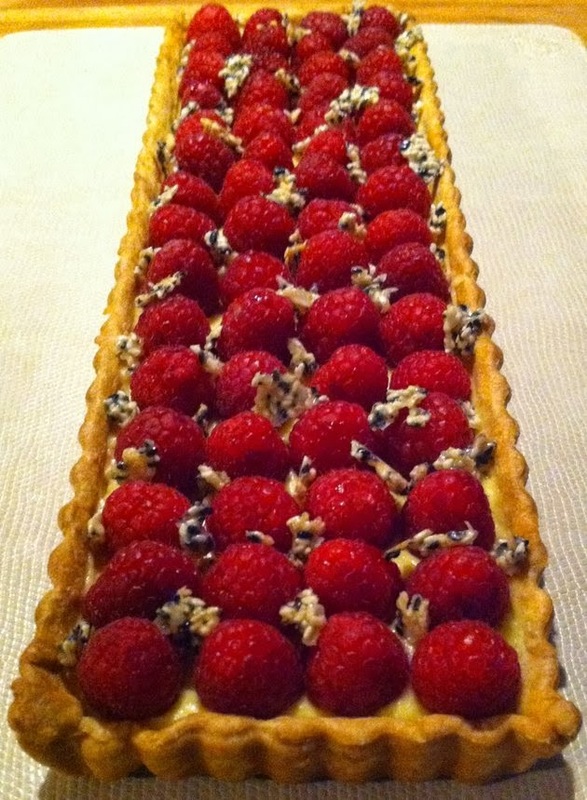 I do these tarts the Express way , by that I mean with shop bought ready rolled short crust pastry . My favourite Ready rolled shortcrust pastry is from Greenvale at ALDI @ €1.29 . Rolls out like a dream and bakes in 20 mins . These tarts from start to finish takes 30 mins . Lightly grease a tart tin , preferably with a removable base . 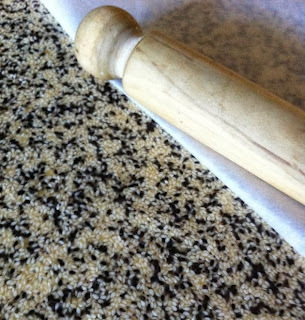 Roll out the pastry out of it's grease proof paper wrapping and ease it into the tin , gently pressing it into the corners and trimming the edges with a knife . 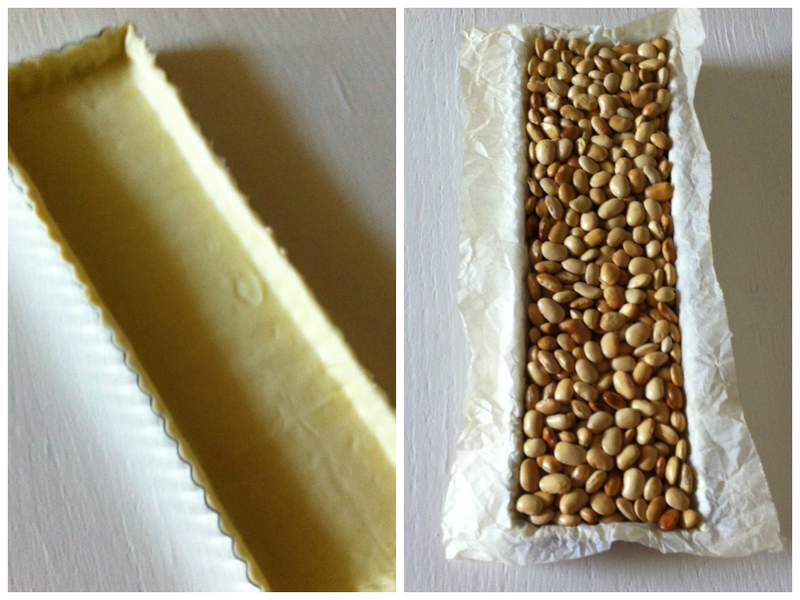 Rest the pastry in the fridge for 5-10 mins , this prevents it from shrinking when baked . 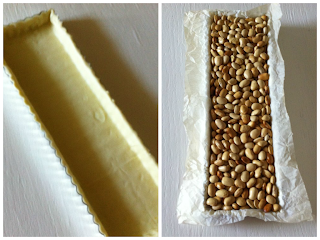 Cover with the grease proof paper wrapping and fill with dried beans and blind bake for 15 mins at 180 . Remove the beans and bake for a further 5 mins or until golden . 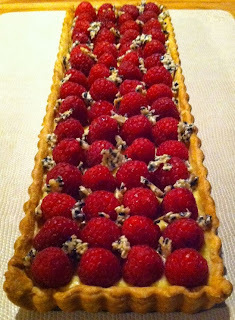 Leave the tart shell to cool , then carefully remove from the tin . 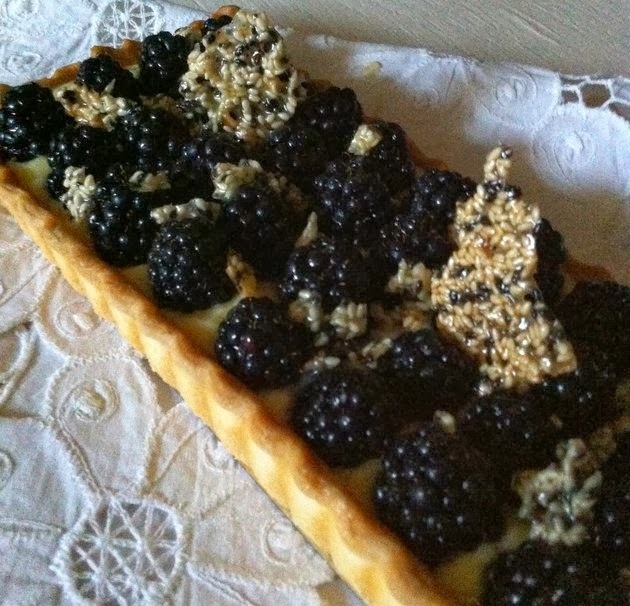 While the tart is in the oven , make your desired filling . Here are the 3 choices . Heat up the milk . Whisk up the egg yolks & sugar . Add the flour and whisk until smooth , add the vanilla. Pour the hot milk over the egg mixture while continuing whisking . Pour back into the pan and whisk over medium heat until thickened into a thick custard and starting to come away from the side of the pan . Pour into a bowl , cover with a skin of cling film to prevent a skin forming and allow to cool until needed. Melt the white chocolate in a pry ex bowl set over a saucepan of simmering water , making sure the bottom of the bowl doesn't touch the boiling water. Stir until melted, then whisk in the egg yolks and add a drop of hot water if needed . Finally fold in the whipped cream, cover with a skin of cling film and chill until needed . Heat up the lemon juice .Whisk the sugar , eggs and yolks . Pour the hot lemon juice over the egg mixture and put back into the pan and cook over medium heat while continually whisking until it reaches boiling point . Add the gelatin and whisk to dissolve . Cover with a skin of cling film and chill until needed . Cook all of the above in a heavy based pan over medium heat to a thick pliable paste and until the mixture comes away from the sides of the pan . 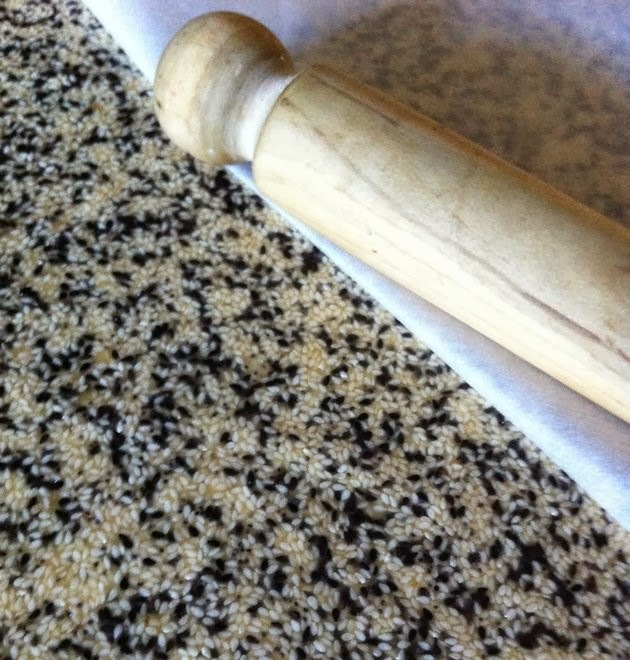 Pour onto a sheet of greased proof paper , cover with another sheet and roll to a thinnish thickness . Divide and freeze until needed . Bake at 160 until golden . Allow to cool , then break into small pieces and sprinkle over the tart . Makes also a great garnish for ice cream and other desserts . Cut out shapes with a scone cutter , while still hot or cut into triangles with a knife and rest over a bottled lying down until cooled and set . Freezes really well , uncooked .